I’m sure that, like me, you often sit there wondering what traditional Chinese instruments would sound like in a rock band setting, particularly the venerable guqin of course. 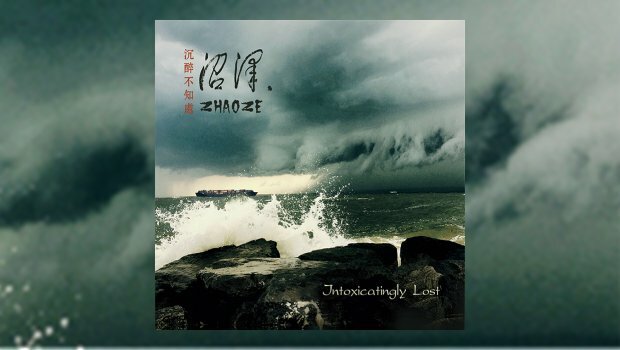 Well wonder no longer as Zhaoze take us on a beguiling, largely instrumental post-rock trip with traditional sounds beautifully interwoven with modern instruments. I must admit my ignorance, I didn’t know what a guqin was but the sound is so quintessentially Chinese that it is immediately familiar. With a history going back 5,000 years and sometimes referred to as “the father of Chinese music”, China’s oldest stringed instrument is a seven-string member of the zither family, fretless and played by plucking. Zhaoze utilise it innovatively, electrified and using a cello bow and distortion to give a unique voice and fresh energy. Adding to the already intriguing musical palette are the individual tones of the xino bamboo flute and glockenspiel. Zhaoze, from Guangzhou in China, treat the traditional sounds with the reverence they deserve. This is not a novelty presentation, it’s a seamless integration of old and new that opens traditional music to new listeners. To the ear of someone not familiar with Chinese music this collection of recent material from the band, their first outside China after releasing five albums domestically since 2010, is well named – I have been intoxicatingly lost in it for weeks. All of the pieces are originals, written and arranged by Zhaoze, and this is an achingly beautiful, serene and uplifting listen. Immediately striking are the skittering drums and echoed guitar at the start of The Worthless, creating an otherworldly wash before the guqin is introduced, supported by piquant glockenspiel. The Worthless flows into See You In The Dusk as the mood is retained. There is great depth and all of the pieces are crammed full of lilting melodies, however the modern instruments are never subsumed under the sound of the guqin and make themselves heard throughout, the “Rock” button being firmly pushed on tracks like Luò Mù (Falling Leaves) and The Youngster Fishing For The Stars where the guitar goes into overdrive. There is space for flights of instrumental fancy within the framework of the pieces, this is not a samey listen but vibrant and dynamic, all of the instruments working together beautifully, and judging from the live clips available they are a stunning experience in the flesh. Their 1911 album, which integrated a Western classical symphonic form, is represented by the third movement, a beautiful and elegiac poem, possibly commemorating the Guangzhou Xinhai Uprising of that year. Themes seem to flow from track to track, as is apparent during the early part of the plaintive and atmospheric The Youngster Fishing For The Stars which references 1911. The xino introduces Lonely Shadow Would Dance, sparse harmonics carrying it forward to a post-rock guitar part. The whole thing is as light as a feather despite the guitars becoming more dense towards the end. Sleepy Child Sweet Smile is a wonderful integration of all the elements – rock band, xino, guqin and glockenspiel – in a lovely melody, nostalgic yet forward looking, as the title might suggest. Vocals add a new texture to Into Your Dream, the energy building to a suitably epic crescendo and fading back to keyboard supported guqin. It’s all wonderfully warm and satisfying, the title track tying things up and showcasing the band perfectly, from a delicate start the lengthy piece moves through a number of themes and ends the album on a note of contemplative calm. The detail is superb. Soulful, poetic and exhilarating, Intoxicatingly Lost is a fantastically immersive collection with no weak points. It is ethereal yet grounded, a worthy representation of venerable traditions and how they should be allowed to evolve with time. I urge you to give Zhaoze a listen.